President Muhammadu Buhari has promised the people of Zamfara State that the security situation in the country will improve soon. 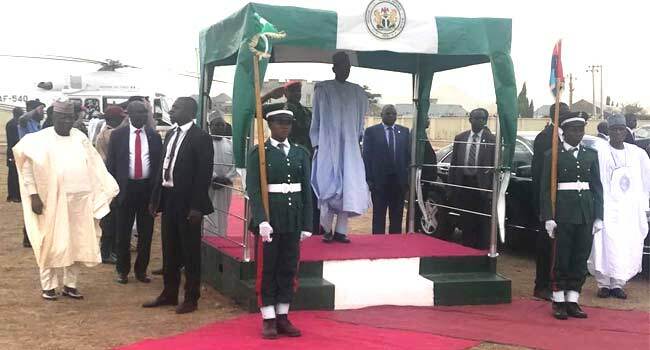 President Buhari who is in the state on an official visit said this on Thursday, that the state will start experiencing some security improvement before the next rainy season, which is in a few weeks. While addressing the crowd, he expressed concern over the rate of unemployed youths in the state and the country as a whole, the President promised to support to the youths and bring the rate of unployement to the barest minimum. On rehabilitation of roads, he said he would refund the monies spent on reconstruction of Federal Government roads in the state. President Buhari arrived at the Katsina Airport on Thursday morning where he was warmly received by the state Governor Aminu Bello and members of the executive council, after which he left for Zamfara.